Peter Bennett at bluewater tells me he's just closed on the sale of Mangusta’s 30.5m motor yacht Equilibrium to a direct client. Built by Overmarine in 1996, Equilibrium can accommodate up to eight guests and runs with a crew of four when on charter. She’s had several upgrades including a refit in 2011. 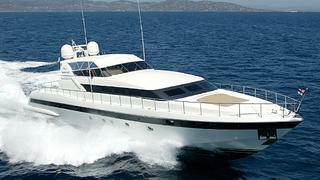 Featuring a spacious swim platform and twin 2285 MTU engines, Equilibrium was asking €850,000.